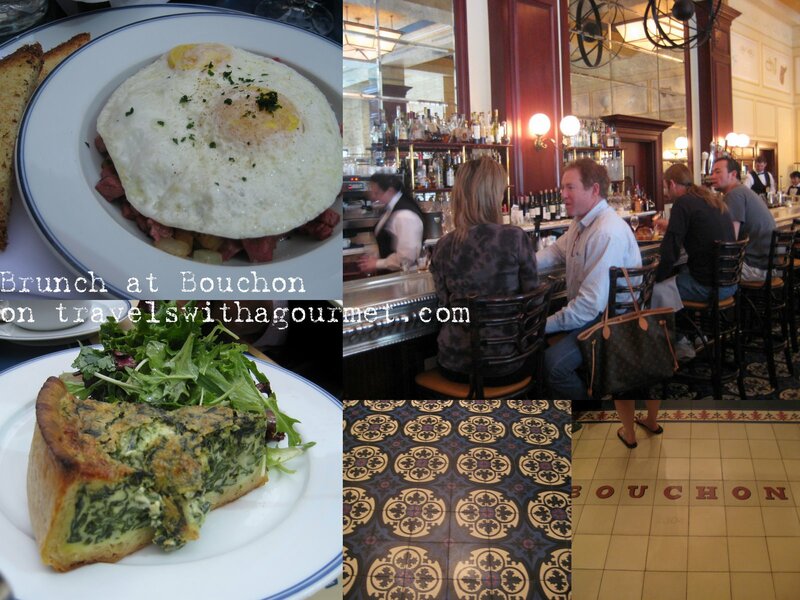 Brunch options in Las Vegas are endless with every hotel having a large buffet spread in at least one restaurant but we always end up in the same place – Bouchon. Thomas Keller’s Vegas outpost of his homey French bistro is an exact replica of the original Napa Valley branch. The only difference is the cathedral ceiling and large terrace by the pool. We had agreed to meet some friends for brunch on Saturday and since they don’t take reservations, we arrived fairly early so we could ensure we got a table which was pointless as they only seat complete parties. Lucky for us, there were still loads of tables available. We sat near the extra-long zinc bar and had some espressos as we waited for our friends to arrive. When they showed up, we asked for an outdoor table and we were seated overlooking the pool near an outdoor heater (lucky for me) and given the brunch menus. Las Vegas’ Bouchon is only open for breakfast and dinner plus brunch on weekends so it’s got a different vibe from the Napa Bouchon. The menu has classic breakfast items like steak and eggs and French toast plus some heavier brunch-style dishes like Steak-frites and Chicken and waffles. There are also several daily specials on the board. On that day for example, there was a Crab Benedict and a roasted pork belly. I knew what I wanted since I checked the menu earlier – Corned Beef Hash and eggs for me which came served with brioche toast. A had the quiche du jour which was spinach and Ricotta served with a small green salad. O had the fruit salad with some vanilla yogurt while her husband, D, had some yogurt as well and the omelette du jour – bacon and onion with some breakfast sausages on the side. Coffees for everyone plus a loaf of Bouchon’s famous epi baguette served with some demi-sel butter. The food was delicious and the service seamless. At Bouchon, you always know what you’re going to get – good food and great atmosphere – which is why after all these years, it still brings the crowds in. Glad you enjoyed it Miguel! Are you still in Vegas?